The most basic of Space Needle facts relates to the what, where and why of its creation. The Seattle Space Needle is an observation tower which was built in the city of Seattle, Washington, in 1962. The tower was built in honor of the 1962 World’s Fair. When it opened for the fair, the tower drew almost 20,000 visitors per day who ascended the tower via the elevators. It hosted in excess of 2.3 million visitors over the duration of the fair. Nowadays, it receives more than a million visitors annually, and is the most popular tourist attraction in the Northwest USA. The Space Needle was named as a historic landmark by the Landmarks Preservation Board in 1999. There’s more to the tower than just an observation deck. For many years the “halo” of the Space Needle was home to two restaurants, the Eye of the Needle and the Emerald Suite. However, these were closed in 2000 to make way for the revolving SkyCity restaurant. 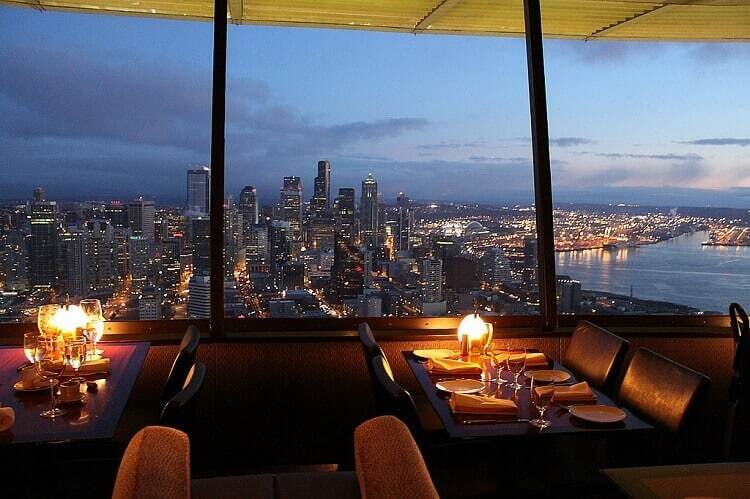 At 500 ft. (152 m) above ground, the restaurant rotates 360 ° in 47 minutes. From the top of the Space Needle, a visitor gets great views of the Seattle skyline, along with the Olympic and Cascade Mountains, Elliot Bay and the surrounding islands. One of the most noticeable and most famous Space Needle facts concerns its impressive height. The tower is 605 ft tall, (184 m) and at the time it was built, it was the tallest structure west of the Mississippi River. It’s not just impressively tall − the tower weighs in at 9550 tons, and is 138 ft (42 m) wide. The rotating restaurant is located at 500 ft (152 m), and the observation deck is at 520 ft (158 m). At the very top of the tower’s needle is an aircraft warning beacon. To balance this enormous structure, the Space Needle needed a huge foundation. Its concrete foundations go 30 ft (9 m) deep, but the base is only on a 120 by 120 ft (36 by 36 m) area of land, as this is the size of the plot originally purchased for the tower. There are a total of 848 steps in the tower, stretching all the way from the basement to the observation deck. This famous tower came about as a compromise between several different design ideas, and there are many intriguing Space Needle facts about how the current design was conceived. In the early 1960s, Edward Carlson was a Seattle businessman, and chairman of the World Fair, while John Graham was an architect. Carlson had an idea for a giant balloon tethered to the ground, which the eventual sloping base of the tower resembles. Graham, on the other hand, had a concept of a flying saucer on the tower, reflected in the halo which houses the Space Needle’s restaurant and observation deck. Graham also suggested that the restaurant should revolve. It was actually another architect, Victor Steinbrueck, who contributed the idea of the tower’s hourglass shape. The 120 ft by 120 ft (36 m by 36 m) plot on which the Space Needle was eventually built was purchased in 1961. This led to one of the most extraordinary Space Needle facts − the tower was constructed in just 400 days! 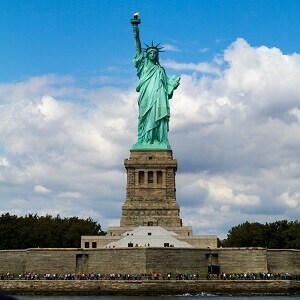 It was consequently dubbed the 400 Day wonder, and opened at the 1962 World Fair on schedule. The land for the tower was bought for $75,000, and construction was financed by the Pentagram Corporation. Construction crews worked around the clock to get the job done. While creating the foundations, 467 cement trucks achieved the largest continuous concrete pour in Western history, taking 12 hours to fill the 30 ft (9 m) deep foundation hole. After the foundation was complete, the main structure was bolted to it with 72 bolts, which were each also 30 ft long. There are numerous Space Needle facts relating to the durability of this structure. The tower sways around 1 inch (2.5 cm) for every 10 mph (16 kph) of wind, but it is actually built to withstand up to 200 mph wind velocity, or 320 kph. This is double the standard set out in the building requirements which were in place in 1962. To further raise safety standards, the Space Needle elevators reduce their travelling speeds whenever there are high winds in the city. The Space Needle is also designed to withstand earthquakes up to a magnitude of 9.1. 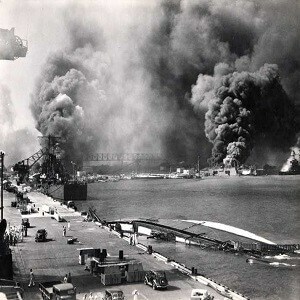 This was the strength of the 1700 Cascadia earthquake, which is believed to have caused a great deal of damage in the Pacific Northwest region. In 2001, a 6.8 magnitude earthquake occurred in the area, and jolted the Space Needle, causing water to slosh from the bathroom toilets, but no more serious damage was incurred. The tower’s unusually deep foundations help to protect the building. Finally, the tower is adorned with 24 lightning rods plus the Needle itself, which in total form 25 lightning rods to protect the Space Needle from lightning strike. One of the more famous Space Needle facts relates to the thrilling ride to the top. The elevators in the tower move at 10 miles per hour, or 16 kph. The trip up the 605 ft (184 m) building takes just 41 seconds. That is, unless it is a particularly windy day, in which case the elevator speeds are slashed in half for safety reasons. 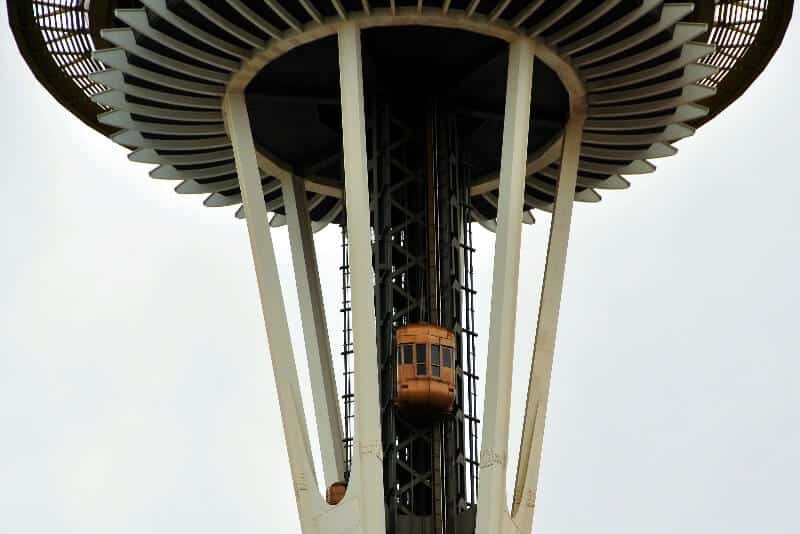 The Space Needle’s elevators were a part of the original design − indeed, the final elevator car was only delivered on the day before the 1962 World Fair. In 1993, the original elevators were replaced with newer, computerized models. There are intriguing Space Needle facts relating to the night of New Year’s Eve 1999. To celebrate the new Millennium, a powerful beam of light, known either as the Legacy Light or Skybeam, was shone from the tower for the first time. 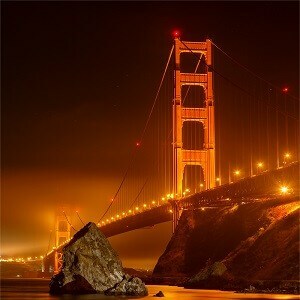 This light is powered by 85 million candela lamps. This idea had first been considered in 1962, but no such light beam was added to the original design. However, it is now an integral part of this famous landmark, and shines vertically from the needle on special occasions in Seattle and on national holidays. Although the light was originally intended to shine for around 75 nights a year, it has generally only been used for around a dozen occasions per year. After the terrorist attacks of 9/11, the light was lit for 11 consecutive days to honor the fallen. With its stunning views and its status as a historic landmark, not to mention its restaurant, the Space Needle hosts many personal celebrations and parties. But it is also a great place to go for more general celebrations, and there are many Space Needle facts to attest to this. 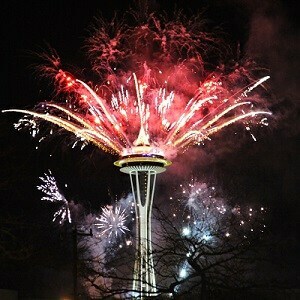 Every New Year’s Eve, the Space Needle plays host to a popular fireworks display at midnight, synchronized with music. After the University of Washington Huskies won the 1992 Rose Bowl, the team’s logo was temporarily painted on the tower, and when Washington State won the Apple Cup, the whole tower was painted crimson. The Space Needle is also known for celebrating its own landmark moments. As part of the tower’s 50th anniversary, the Needle was painted “Galaxy Gold”, the same color it had been when originally constructed in 1962. And in 2007, the guest Greg Novoa became the 45 millionth visitor to the Space Needle. He was rewarded with a free trip to Paris. As the Space Needle gets older, certain changes and developments take place to keep the structure safe and popular. In the year 2000, renovations to the structure, which cost around the same as the original construction price, were completed! The observation deck was given an overhaul, and lighting was changed and added. The SkyCity restaurant was also constructed, as was the SpaceBase retail story and the Skybeam installation. One of the more surprising Space Needle facts is that until 2008, the tower had not been professionally cleaned since its 1962 opening. In May 2008 this all changed, as a professional service was employed to clean the monument. This process included a pressure washing at the pressure of 20000 kilopascals, and a temperature of 194 °F (90 °C). One of the most undeniable Space Needle facts is that the structure has had an enormous effect on pop culture. 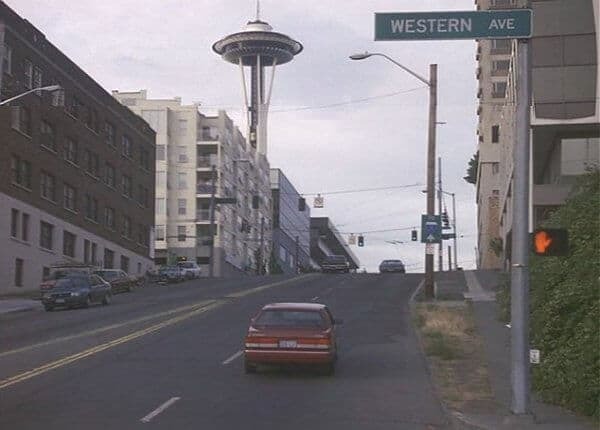 The vast majority of film and television shows which aim to show that they are based in Seattle show a shot of the skyline with the Space Needle clearly prominent. Examples of films which use the Space Needle as a location include It Happened at The World’s Fair and Sleepless in Seattle. In the 1999 film Austin Powers: The Spy Who Shagged Me, the Space Needle is used for comic effect, when the villainous Doctor Evil takes over the tower and makes it his lair. 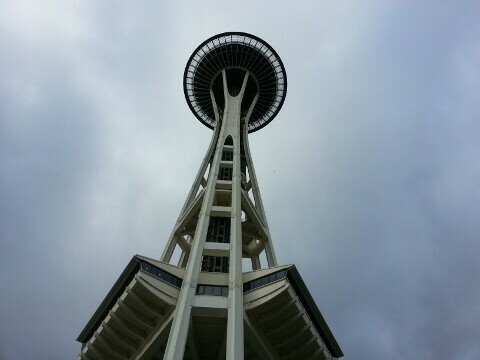 There are several Space Needle facts for adrenalin junkies. In total there have been six parachute jumps from the tower since its 1962 opening. Of these, only four were actually legal. These four were carried out for various promotions, but in the other cases it was considered a breach of the law, and the perpetrators were arrested. Pay close attention to these Space Needle facts and you could find something valuable! During the 1962 World’s Fair there were over 200 copyrights on souvenir items at the Space Needle. Many of these commemorative items have now become sought-after collectables − a particular bestselling item at the fair was a needle-shaped golden charm containing a light. If you’re a first-time visitor on the other hand, the Space Needle now has a shop with plenty of new souvenir items, from key chains to salt and pepper shakers. In 1989, some completely false Space Needle Facts were shared by the Seattle comedy sketch show “Almost Live!” On April’s Fools Day they aired a joke report claiming that the Space Needle had fallen over. Their prank backfired, however, when many local residents took them seriously. So many people called 911 that the Emergency Service lines were blocked, and the Space Needle itself received over 700 telephone calls. The channel’s Programming Director apologized for the prank the next day. In 1962, early plans for the Space Needle included the notion of building a stork’s nest, with resident birds which would live at the top of the tower. How this idea made it even as far as it did is one of the more mysterious Space Needle facts, since storks actually only live in warmer climates and would soon have migrated away from the nest. Luckily, someone realized this major flaw in the plan, and the stork’s nest was exiled from later drafts of the building plans. CHEESE, otherwise known as The Committee Hoping for Extra-terrestrial Encounters to Save the Earth, have a theory about this landmark which might be the very strangest of Space Needle facts. They believe that the Space Needle was constructed to transmit signals to advanced life forms − i.e. aliens − in other solar systems. They also claim to have original plans from 1962 which prove this! The 1962 World’s Fair certainly was space-themed, but many will think the rest of this theory a little unlikely. A particularly fascinating optical illusion occurs for those using the Space Needle Elevators during a snow storm. Since the elevator cars travel at 10 mph, or 16 kph, they equal the speed at which a raindrop falls to earth. But, more excitingly, they are faster than the rate of a falling snowflake, which is just 3 mph (4.8 kph). So, while journeying up the tower in snowy weather, the snow appears to be falling upwards! At a Seattle press conference in 1964, The Beatles were asked if they had visited the Space Needle. But the famous foursome weren’t keen on learning any more Space Needle facts − none of them had gone inside. In response to questions about why this was, John Lennon admitted “I don’t like heights” and George Harrison said “It looks better from the ground”. In his 1974 book, Wheedle on the Needle, children’s author Stephen Cosgrove created a fictional creature called Wheedle. This cute, furry creature lived on top of the Space Needle, and made the light flash. The Wheedle is now a Seattle symbol too, and was even the mascot of the Seattle SuperSonics for a time. In his 2012 music video for the song Can’t Hold Us, Seattle-born rapper Macklemore took his iconic Heist flag all around the world. After travelling across six continents, the music video ends with an image of the flag being flown at the top of the Space Needle. In the late 1970s, the city of Fife, Washington State, reportedly tried to buy the Space Needle from Seattle. They made an offer of $1 million to move the monument to their own downtown area. Luckily, the offer was declined, and today we can talk about Space Needle facts, rather than facts about the tower in Fife. Rumors that if moved, the monument would be renamed the Fiffel Tower are unconfirmed. The Space Needle is an observation tower in the city of Seattle, Washington State. Standing at 605 ft, or 184 m, the tower was once the tallest structure west of the Mississippi River, and is a dominant and famous part of the Seattle skyline. It was built in 1962 for the World’s Fair, and construction was completed in a groundbreaking 400 days. The tower is resistant to earthquakes and hurricane force winds. Its elevators travel up the tower at 10 mph (16 km), and there is a rotating restaurant at 500 ft (152 m), which takes exactly 47 minutes to rotate a full 360 °. From the restaurant and observation deck, the tower boasts splendid views of the city of Seattle, and Olympic and Cascade Mountains, along with the bay and surrounding islands.